We’d love your help. Let us know what’s wrong with this preview of "Stand Back," Said the Elephant, "I'm Going to Sneeze!" by Patricia Thomas. 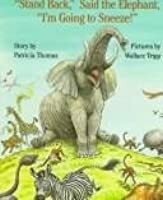 To ask other readers questions about "Stand Back," Said the Elephant, "I'm Going to Sneeze! ", please sign up. Is there another book (poem) that is just as good as this book? My daughter said this book last year in a poetry contest. The judges LOVED it. I need another book as good as this one. Titles with an Exclamation Point! Oh my goodness. So funny, I truly did laugh out loud. The pictures are funny enough for toddlers to enjoy, the rollicking rhyme will encourage an independent reader to read this over and over, the pictures of the animals reacting to the elephant's announcement are vividly both true to the animals and true to the humor, there are a lot of different animals to meet, and the two-part ending packs a punch neither to be expected nor soon-forgotten. As you can read, I'm still breathless & giddy. I Oh my goodness. So funny, I truly did laugh out loud. The pictures are funny enough for toddlers to enjoy, the rollicking rhyme will encourage an independent reader to read this over and over, the pictures of the animals reacting to the elephant's announcement are vividly both true to the animals and true to the humor, there are a lot of different animals to meet, and the two-part ending packs a punch neither to be expected nor soon-forgotten. The elephant, of course, is going to sneeze. (Actually, there are youtube videos of elephants sneezing and not much happens because of it, but realism isn't the point, now is it?) So he warns everybody, and they start giving these long (long! don't read this book to a kiddo with a short attention span!) pleas, reminding him of the disaster that struck the LAST time he sneezed - the bear went bare, and all the hippopotamuseses fell on their bottomuseses, the feathers fell off the birds and the fl The elephant, of course, is going to sneeze. (Actually, there are youtube videos of elephants sneezing and not much happens because of it, but realism isn't the point, now is it?) So he warns everybody, and they start giving these long (long! don't read this book to a kiddo with a short attention span!) pleas, reminding him of the disaster that struck the LAST time he sneezed - the bear went bare, and all the hippopotamuseses fell on their bottomuseses, the feathers fell off the birds and the flowers off the trees.... Well! It was not a pretty picture. But the poor elephant is undeterred. He MUST sneeze. He WILL sneeze... until he doesn't. The winning element for me on this story is the artwork. The illustrations are just the right combination of realistic and ridiculous. Take for instance the very surprised zebra watching his black stripes fly in all directions or the birds hav "Stand Back," Said the Elephant, "I'm Going to Sneeze!" by Patricia Thomas is a doozy of a title. But it gets to the heart of this silly rhyming story. An elephant is having a bad case of sneezes and they are causing no end of trouble for the other animals. Not only is this one of my favorite children's books, it's also a favorite of my mother's. I think she could recite nearly the entire thing. The illustrations are by Wallace Trip (who authored & illustrated another of my favorites: Sir Toby Jingle's Beastly Journey). It's a wonderful & hilarious book. As the elephant is about to sneeze, he warns all the animals & insects to flee, due to the damage he inadvertently does to them. However, a small mouse takes it upon himself to try to i Not only is this one of my favorite children's books, it's also a favorite of my mother's. I think she could recite nearly the entire thing. The illustrations are by Wallace Trip (who authored & illustrated another of my favorites: Sir Toby Jingle's Beastly Journey). It's a wonderful & hilarious book. As the elephant is about to sneeze, he warns all the animals & insects to flee, due to the damage he inadvertently does to them. However, a small mouse takes it upon himself to try to interrupt the sneeze, with cataclysmic repercussions. This is an absolutely wonderful children's book that will delight everyone who reads it. I don't know when I first read this children's book. I think I ordered it from the "I Can Read" book club back when my two children were quite young. That would be in the mid-70s. All I know is that I still have that copy. My children and I both loved it and they asked me to read it to them dozens of times. The story is charming, the rhymes hilarious, and the illustrations wonderfully done. Everbody has to run away because [spoiler alert] the elephant was going to sneeze. Was that a magic world? How did every single zebra stripe go bye-bye and his mouth turned rightside out? I feel so sorry for the animals who ever have to live with this particular elephants. Although he seems like he is friendly and maybe a great guy down in heart he is so unpredictable with his responses to the world around him that he ends up causing more problems than can ever be expected. Sounds like some of us right? This is a great book and its rhyming words will please the ear of young children. Unfortunately it is a bit on the longish side so the youngest of children may not find it as ent I feel so sorry for the animals who ever have to live with this particular elephants. Although he seems like he is friendly and maybe a great guy down in heart he is so unpredictable with his responses to the world around him that he ends up causing more problems than can ever be expected. Sounds like some of us right? This is a great book and its rhyming words will please the ear of young children. Unfortunately it is a bit on the longish side so the youngest of children may not find it as entertaining as the older children although the illustrations can lead to some interesting laughs. This is super cute! I was surprised Julia got as into the illustrations as she did, just because of the more reserved tone but she really, really enjoyed them. She devoured each page. I'd be lying if I said I didn't do the same. The story is one of the few that really can make you LOL. In a time when this little term, three little letters, make everything seem so darn funny, this story really is. We read in the back of the book that this was Patricia Thomas' first book! I'm going to have to see This is super cute! I was surprised Julia got as into the illustrations as she did, just because of the more reserved tone but she really, really enjoyed them. She devoured each page. I'd be lying if I said I didn't do the same. We read in the back of the book that this was Patricia Thomas' first book! I'm going to have to see if she went on to write anything else. This is by far the most memorable book from my childhood. 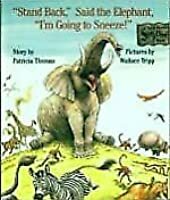 I vividly remember my mother reading this book to me with such expression in her voice every time the elephant was about to sneeze! I remember giggling every time the huge let out a sneeze that was so fierce and powerful it caused a disaster! Every time the elephant would sneeze, the animals from the previous disaster-causing sneeze would beg the elephant to never sneeze again! The illustrations were a great interpretation of the elephant This is by far the most memorable book from my childhood. 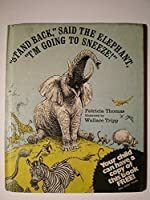 I vividly remember my mother reading this book to me with such expression in her voice every time the elephant was about to sneeze! I remember giggling every time the huge let out a sneeze that was so fierce and powerful it caused a disaster! Every time the elephant would sneeze, the animals from the previous disaster-causing sneeze would beg the elephant to never sneeze again! The illustrations were a great interpretation of the elephant and his animal friends. The illustrations were lively and captivating to the eye because of the over the top nature of the illustrations that still managed to be realistic and believable. Very genius Patricia Thomas! I think that children, and even adults, will appreciate and enjoy the rhyming scheme that this book uses to aid in creating the silly-nature of this book. Reading this book aloud to students would give the teacher a great opportunity to read with vigor and expression that will be engaging and lively for the students listening! I dare students to listen to this book being read aloud and not let out a silly laugh or two themselves! 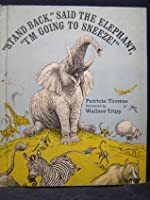 One of the great read-alouds, particularly if you are a ham reader and pretend to be an elephant warning the forest and grassland and river and lake animals that you are about to sneeze while you are trying your best not to. This was a favorite when my own thirty-something daughters were young children. I bought a gift copy (and one for me) for a friend’s three-year old. It is not quite Seussian, though it doth so aspire, McGuire, and it’s close enough in wit and rhyme to count or miscount as di One of the great read-alouds, particularly if you are a ham reader and pretend to be an elephant warning the forest and grassland and river and lake animals that you are about to sneeze while you are trying your best not to. This was a favorite when my own thirty-something daughters were young children. I bought a gift copy (and one for me) for a friend’s three-year old. It is not quite Seussian, though it doth so aspire, McGuire, and it’s close enough in wit and rhyme to count or miscount as discount Seuss. It was written in 1970 or it might have had a an ASPCA verification that no zebra’s stripes, or bear’s hair, or bee’s stings, or bird’s feathers, or fish scales were harmed in the writing or reading of this book. its an elephant that is about to sneeze, but instead of helping the elephent not sneeze, all the animals just yell at him and tell him not to sneeze, because he will destroy everything with a powerful sneeze. Then finaly someone actualy does help their friend out instead of yelling at him. good story. I remember this book from when I was a little girl. No one wants the elephant to sneeze, the last time he sneezed the stripes came off from the zebras, the feathers fell off of the birds, the crocodiles snouts turned inside out. What a fun book! I remember reading this aloud to my children 20 years ago! Wow! Where does the time go?! There is so much joy in the rhyming and my favorite illustration is the one where the zebra loses his stripes! This is a book that needs to be shared. Fantastic book! My daughter loved it so much we read it almost every night while we had it checked out from the library. An old favorite that still stands up well. Very funny, great vocabulary, wonderfully absurd! It is a favorite with our grandchildren. Oh no! Look out! The elephant thinks he’s going to sneeze! This sends the other animals into a panic. The last time the elephant sneezed the birds lost all their feathers, the stripes flew off the zebra, and the monkeys fell out of the trees. The elephant tries, but he really can’t help it he’s about to sneeze. And then at the very last second out pops a mouse with a deafening, “BOO!” The elephant is so scared that he forgets to sneeze! The animals think they're saved, but then the mouse explain Oh no! Look out! The elephant thinks he’s going to sneeze! This sends the other animals into a panic. The last time the elephant sneezed the birds lost all their feathers, the stripes flew off the zebra, and the monkeys fell out of the trees. The elephant tries, but he really can’t help it he’s about to sneeze. And then at the very last second out pops a mouse with a deafening, “BOO!” The elephant is so scared that he forgets to sneeze! The animals think they're saved, but then the mouse explains that he scared the elephant so that he would stop sneezing. And the elephant finds this so funny he begins to giggle, then chortle, and guffaw. Soon the earth is shaking with the elephant’s laughter and the animals find themselves losing feathers and stripes once again. The detailed line work of the illustrations fills the landscape with hilariously terrified anthropomorphic animals, from the alarmed buffalo to the horrified zebra. The book I have has mostly black and white illustrations with just a couple colored pages. However, I have seen other editions of the book that are completely filled with colored illustrations. Although the all colored edition is definitely more vibrant, the hilarious facial expressions and the text work well with black and white illustrations as well. The rhyming text is a joy to read aloud. It’s mostly dialogue and features a wide vocabulary and many synonyms. Although the book takes its time building up to the climax, the outcome of the elephant’s laughter is a sure-fire ending. Written entirely in poem form, this book enchanted me as a young child visiting my Grandparents. In fact in 6th grade when we had to recite a poem for the class I chose this book- the entire book. Needless to say it is permanently engraved on the fiber of my brain forever. 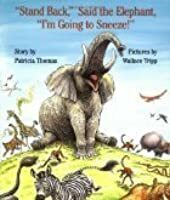 The story follows an elephant who is fighting off a terrible sneeze and warns his friends to stay away. They panic and remind elephant of all of the humorously catastrophic things that happened before (Oh, please, not a sneeze Written entirely in poem form, this book enchanted me as a young child visiting my Grandparents. In fact in 6th grade when we had to recite a poem for the class I chose this book- the entire book. Needless to say it is permanently engraved on the fiber of my brain forever. Calle I first read “Stand Back,” Said the Elephant, “I’m Going to Sneeze!” when my children were little, and now all these years later, it still brings a chuckle or two. The story is written in rhyme with lots of humor by Patricia Thomas, and Wallace Tripp’s artwork is charming. If you can get your hands on a copy of this delightful picture story book, it would be a perfect gift for the young ones in your life.